A computer weaving program, called Video Loom II, has been released by Laurel Software. 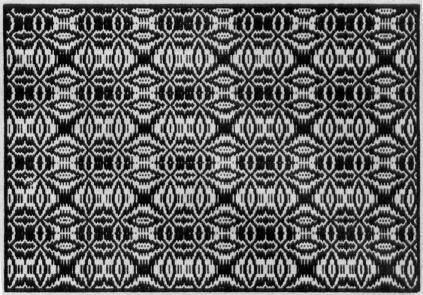 With Video Loom II and an Apple II + personal computer, a weaver can simulte a handloom design and see a high resolution color picture of the resultant textile in seconds. The program is easy to use. No computer experience is required. The computer, via a TV screen, asks the weaver for information about how the "loom" is to be set up, what colors are to be used, yarn sizes, treadling order, etc. The weaver responds by typing answers on an ordinary typewriter keyboard. 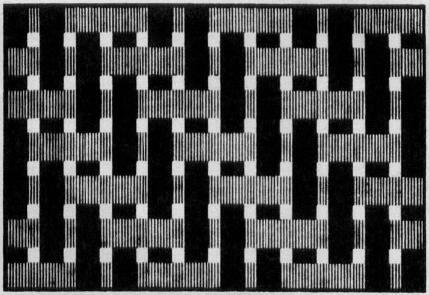 Once the loom is "warped" and the weaving sequence established, the computer draws a full color television picture of the design. The designs can be saved on small, inexpensive (and reusable) magnetic diskettes. The design images can easily be photographed if color slides or polaroid pictures are desired. 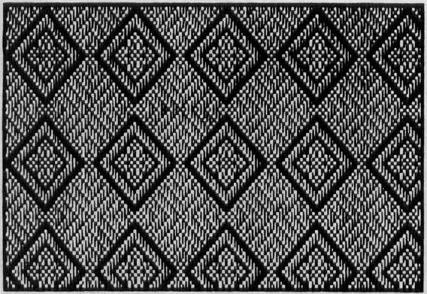 The original Video Loom program, released in early 1979, was the subject of a special exhibit at the 1979 Conference of Northern California Handweavers' Guilds. At the Lawrence Hall of Science, in Berkeley, California, it was used to introduce teachers, textile hobbyists and designers to the principles of computer aided design. For more than three years it has been enabling weavers to preview their designs before going through the time consuming process of warping and creating samples. The new version features fast machine language routines for weaving and drawing, and a foolproof screen editor for setting up the loom. This means that weaving is 20 to 30 times faster than with the original program and that designs can be changed more easily than ever. Video Loom II simulates a 32 harness loom with 64 treadles. The loom can be instantly changed from rising to sinking shed. Designs can be displayed in up to six colors (including black and white). In addition to choosing a threading draft, tieup and treadling, the program allows the weaver to vary warp and weft colors, thicknesses and the spacing between threads. This makes it possible to create design images that look very much like photographs of woven textiles. Alternatively, by using very thick threads and wide spaces, a "magnified" view of a textile can be created. This feature can be used by teachers to realistically display and compare the structures of different kinds of weaves. The program has a mode that permits the weaver to use the computer's keyboard keys as treadles. In this way, a design can be developed one weft at a time, just as if a real loom were being used. During a weaving session, all, or only some, of the design elements can be saved on reusable, magnetic diskettes. Any design element that has been saved can be recalled at any time. This permits, for example, the tieup or treadling from one pattern to be combined with the threading draft from another, without typing in any new data. Hardcopy printouts of the draft, tieup, treadling and all other design elements are available. If the computer is equipped with the proper accessories, a graphics printout of the design images can be obtained at the touch of a key. Video Loom II requires a 48K Apple II + (or an Apple II with Applesoft in ROM or a Language Card) and one disk drive. It comes on a DOS 3.3 diskette with complete, easy to follow instructions. The cost is $59.95 plus $4.00 for postage and handling. Overseas orders should be paid in US currency and require $10.00 for postage and handling. A brochure can be obtained by sending a stamped, self-addressed envelope.